Now here is a theme I can't quite put my finger on. There are so many places I feel this can go what with so many movies that follow multiple characters and storylines. My mind instantly goes to something from Altman in the vein of Nashville or Short Cuts and beyond that to the Altman-inspired work of Paul Thomas Anderson in Boogie Nights and Magnolia. But I don't really want to go there. I've used about every P.T. Anderson movie by now, and, as much as I love those Altman films, I haven't seen them in so long that I wouldn't even know what to say about them. ...I'm going for a theme-within-a-theme on this one. The Teenage One-Nighter. Movies inspired by George Lucas' American Graffiti (1973). Movies that follow young people on intersecting rides through a fateful night when everything comes together in such a way that by the time the morning comes around you find yourself a little older, wiser, more firmly in love, filled with a better understanding of the world, even if you never left the haunts of your hometown. Last day of school. 1976. Suburban Austin, Texas. The incoming seniors, led by QB/budding pothead Randall "Pink" Floyd (Jason London) haze the incoming freshmen, led by ace little league pitcher/budding pothead Mitch Kramer (Wiley Wiggins). But then there's bonding and a failed kegger and running the roads, hitting up the local haunts, getting the resident old-head (McConaughey) to buy all the beer to replace said failed kegger and back and forth and back and forth. Plenty of "intersection." Plus, lots of weed and hilarious dialogue. It plays like so many youthful nights you know so well if, like me, you had these nights. And if you didn't, you wish you did. Admit it. Here is a film that deserves every bit of its status. It is warm, funny, over-the-top, great looking, and incredible to listen to. Graduation night. 1998. Suburban Philadelphia. The Sensitive Writer, Preston (Ethan Embry), has been crushing on Miss Popular, Amanda Beckett (Jennifer Love Hewitt), since freshmen year. She's been dating the Jock, Mike Dexter (Peter Facinelli), all that time. Preston's best friend, Denise (Lauren Ambrose), the above-it-all Arts Geek reluctantly tags along to the big Grad Party, where word has gotten around that the Prom Queen and King have split up. Time for Preston (and everybody else) to make his move. It's also Resident Nerd, William Lichter's (Charlie Korsmo) time to finally take his revenge, and it's White Black Guy, Kenny Fisher's (Seth Green) time to finally get laid. As the strands mix, you have standard high school party rom-com that really worked on me (and many people my age) simply because I was the right age. I could watch this movie on repeat. The days before the new school year. 2010. Suburban Detroit. Two guys, one starting high school, another a year into college, navigate the streets and houses of their neighborhood and even a bit beyond, both searching for that something just out of reach, longing for that youthful idealistic girl that's already slipping away. Two girls, both starting high school, navigate the streets and houses of their neighborhood, both searching for simply the same. None of them find each other or need to. David Robert Mitchell's film is not interested in payoffs or even setups. This is a simple wandering through a night where youth begins to meet adulthood, and, for the most part, the kids this story belongs to are fine to simply be young....at least for one more night. I love that you went with Dazed and Confused and Can't Hardly Wait. I wouldn't have thought of those movies for this topic, but they're perfect. Love both of those flicks so much. A theme within the theme! Love that! I haven't seen your last but the first two are a lot of fun. Dazed and Confused is a great one for future star spotting. I was really surprised at the underlying sweetness of Can't Hardly Wait, it's what makes it stand out from the many other teen comedies that came out around the same time. 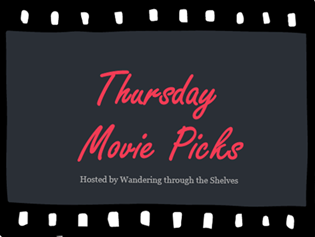 The theme could be interpreted in many ways since most films have stories that intersect but I decided to go with films whose main thrust was to be multi-focused. Vantage Point (2008)-The various stories related to an attempted assassination are told from numerous vantage points. Over plotted but still engrossing film, some story threads are better realized than others. Strong cast includes Sigourney Weaver, Dennis Quaid, Forest Whitaker and Édgar Ramírez. Detective Story (1951)-One day in the life of the detective squad of the 21st Precinct. The intersecting story of the various people who pass through their doors includes: a sweet but dotty old lady; an embezzler and his girl; a pair of blustering burglars and a naive shoplifter (Lee Grant). One of the officers, Detective Jim McLeod (Kirk Douglas) is a tough cynical man whose obsessive pursuit of an abortionist could lead to personal disaster. Both Grant and Eleanor Parker as McLeod’s wife scored Oscar nominations. Grand Hotel (1932)-“Grand Hotel...always the same. People come, people go. Nothing ever happens.” So it seems to the desk clerk of the title building but this tells the tale of many intermingling stories. Creaks a little with age but contains some really fine performances, Joan Crawford’s best early work, the Barrymore brothers, but also some less distinguished ones, Garbo in particular seems stiff in many scenes. The genesis of the all-star picture this holds the distinction of being the only Best Picture winner to do so on a sole nomination. Yeah. 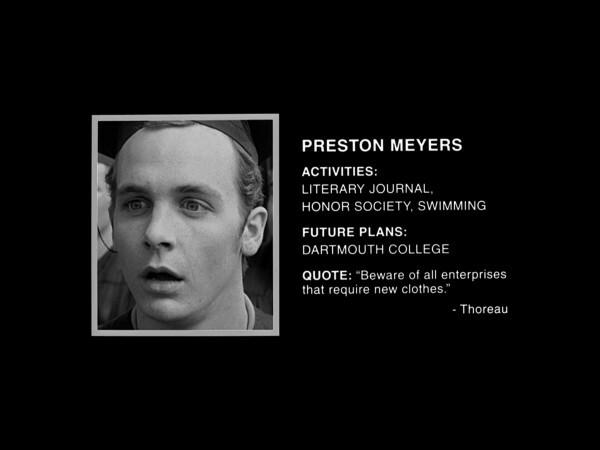 Can't Hardly Wait really is sort of a nice movie overall. Thanks mostly to the Lauren Ambrose character. She is just so good there and went on to be really great in the HBO series Six Feet Under. I have heard of all of you picks, and I really wanted to see Vantage Point when it came out. I just never did. Grand Hotel is surely a familiar title that I need to check out for sure. Great picks! I'm useless here. Haven't seen any of these. D and C is one of those I keep thinking about, but passing it over in favor of something else. I really should watch the damn thing, already. I can't believe you haven't seen Dazed and Confused bro. Get on that. It is a purely easy watch. Can't Hardly Wait! That is my good friend's favorite movie. It's fun and I like it, but no great shakes. LOVE the cast, though. SO 90s! 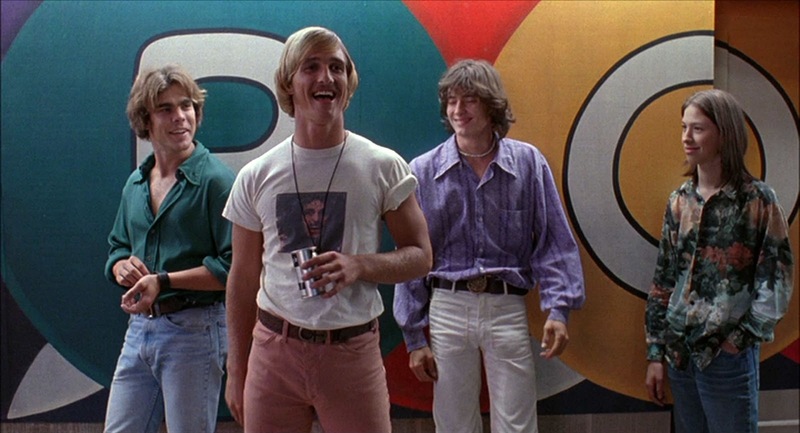 Dazed and Confused is a stone cold CLASSIC. Definitely. So 90s, both of these casts, though the Dazed and Confused cast certainly outlasted them all by a decade and now then some. I've only seen Dazed and Confused, and what a movie! On this list I've only seen Dazed and Confused. I didn't love it nearly as much as everyone else seems to, but -- yes! -- great to listen to. Too bad. It was the cool thing to watch when I was growing up. The high school movie to end all high school movies, simply because it was about my kind of people: cool rebellious stoners. Great picks! Love the fact they are all related to end of year/start of year high schoolers. I haven't seen Myth of the American Sleepover but I saw the trailers and hoped for UK release, but I either missed it or it never arrived here. Thanks! I hope you can find it. I got it through Netflix by mail here in the US, but it is hard to find and only on a really crappy DVD. The Myth of the American Sleepover is new to me. I feel like Can't Hardly Wait became sort of popular in the last decade, I keep seeing it mentioned here and there now, while I don't think it got much notice the year it was released. Both are really solid movies. Very different but both solid.